Integrating geography and location information with AI brings a powerful new dimension to understanding the world around us. This has a wide range of applications in a variety of segments, including commercial, governmental, academic or not-for-profit. Geospatial AI provides robust tools for gathering, managing, analyzing and predicting from geographic and location-based data, and powerful visualization that can enable unique insights into the significance of such data. 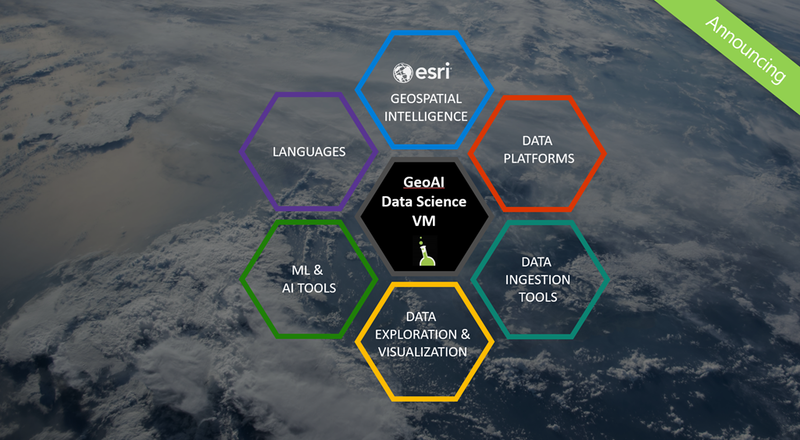 Available today, Microsoft and Esri will be offering the GeoAI Data Science Virtual Machine (DSVM) as part of our Data Science Virtual Machine/Deep Learning Virtual Machine family of products on Azure. This is a result of a collaboration between the two companies and will bring AI, cloud technology and infrastructure, geospatial analytics and visualization together to help create more powerful and intelligent applications. At the heart of the GeoAI Virtual Machine is ArcGIS Pro, Esri’s next-gen 64-bit desktop geographic information system (GIS) that provides professional 2D and 3D mapping in an intuitive user interface. ArcGIS Pro is a big step forward in advancing visualization, analytics, image processing, data management and integration. ArcGIS Pro is installed in a Data Science Virtual Machine (DSVM) image from Microsoft. The DSVM is a popular experimentation and modeling environment on Azure that provides a host of AI, machine learning and data science tools. These are all conveniently pre-configured for immediate productivity. The DSVM can run either on CPU-only VM instances on Azure or leverage GPU based VM instances which are particularly useful when training large-scale deep learning models. The Geo AI Data Science VM extends the AI and data science toolkits in the Windows Server 2016 edition of the Data Science VM by adding ESRI's ArcGIS Pro and interfaces in both Python and R to help data scientists leverage the spatial data, rich GIS processing, visualization and analytics in ArcGIS Pro to create better AI applications. For the geospatial analytics professionals, this product now brings in powerful new AI and predictive analytics capabilities including deep learning and machine learning algorithms. Deep learning algorithms are very effective in understanding image/raster data, time-series, and unstructured textual data. The GeoAI Data Science VM also makes it easy to develop for Azure and use big data services like Apache Spark within the VM for analytics. All the tools are pre-installed and pre-configured so that data scientists and geospatial analysts have a ready-to-use environment. Data scientists and researchers at Microsoft and Esri have been using the GeoAI Data Science VM to automate the analysis of land cover maps in fragile watershed environments using deep learning. For example, it’s now possible to use AI to classify land cover at the pixel level in satellite imagery and extract semantic information at incredible scale. Together GIS, AI and the Data Science Virtual Machine are enabling deeper insights that are integrated with geospatial intelligence leading to more accurate predictions and better decision making. It is very easy to create your instance of the GeoAI DSVM and begin your analytics quickly. After clicking on the product link and answering a few simple questions, you are up and running in just a few minutes with a fully configured environment. In addition to the comprehensive ML and deep learning samples, a set of geo-spatial AI examples are provided on the VM, to help you get started quickly. The VM also contains a full end-to-end tutorial on land use classification at a pixel level using deep learning and Azure GPU instances. We also demonstrate how you can build and deploly such applications on the Azure cloud with all the tools built into the Geo AI Data Science VM. We hope these examples provide you some ideas on combining AI and geo-spatial analytics to develop more accurate predictive models and deliver AI innovative applications. The Geo AI Data Science VM with ArcGIS on Azure brings geo-spatial analytics, AI and the hyper scale cloud platform to help you derive deeper insights and build large scale applications that are more intelligent. Give your AI applications a whole new dimension with geo-spatial data and analytics!